Tonight, 31st December 2016, there will be a leap second – the 27th time we have added such an extra second to a day since they were first introduced in 1972. Why do we have leap seconds? Leap seconds are added to keep clock time measured by extremely accurate atomic clocks in agreement with astronomical time measured by the rotation of the Earth. At the moment the time it takes for the Earth to spin once on its axis is about one thousandth of a second longer than 24 hours (86,400 seconds). So day by day, clock time gets increasingly ahead of astronomical time. In fact, if we didn’t add leap seconds, eventually (and admittedly this takes several thousand years) 12:00 would be at midnight rather than at noon. Historically we defined the day by the apparent movement of the Sun, for example from one noon to the next. I’ve written before about how the day length measured in this way increases and decreases during the year due to the combined effect of the Earth’s elliptical orbit and the tilt of the Earth’s axis – the so-called equation of time. However, even if we average out these annual effects it turns out the length of the day also changes because the Earth’s rotation is both irregular and gradually slowing over time. The irregularity is caused by variations in the flow of material in and around the Earth’s core, the effects of weather (winds and precipitation) and even earthquakes. In a similar way, to how a spinning ice skater can speed up or slow down by bringing their arms in close to their body or stretching them out, a change in the distribution of mass in the spinning Earth will change the speed at which it spins. Just like the weather these effects are not possible to predict far in advance and so we only get a few months’ notice of whether a leap second needs to be inserted (for example, today’s leap second was announced in July). The Moon raises tides on the Earth which act to slow the Earth’s rotation and so increase the length of the day by about two thousandths of a second each century (and also increase the separation between the Earth and the Moon by almost 4 cm each year). With the addition of the tidal effect the accumulating effect of the day being slightly longer than 24 hours gets increasingly more and more significant. Who decides to add a leap second? If clock time gets more than about 0.4 seconds out of step with astronomical time then the Earth Orientation Center of the International Earth Rotation and Reference Systems Service (IERS) based in the Paris Observatory announce a leap second needs to be inserted so that the two time scales always agree to better than one second. For obvious reasons, they are sometimes known as the “Time Lords” – what a job title! Clock time, known as Coordinated Universal Time (UTC), is determined from International Atomic Time (TAI) by comparison with astronomical or navigational time (Universal Time UT1). TAI has been measured by extremely accurate atomic clocks since the 1960’s. UT1 is determined from measurements of the rotation of the Earth by various means including radio telescope observations of quasars (distant galaxies powered by supermassive black holes). These VLBI (Very Long Baseline Interferometry) experiments measure how the Earth spins against this effectively fixed grid of very distant point-like objects. 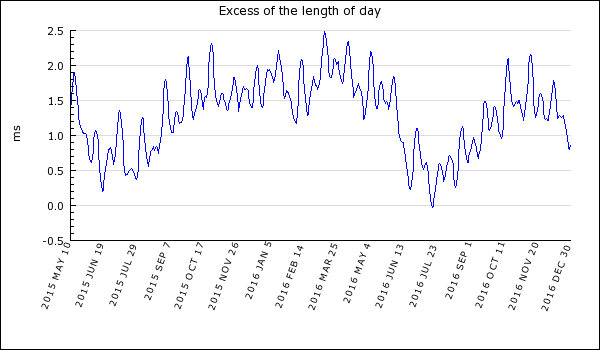 The Earth Orientation Center provide up-to-date data showing how the length of the day is changing continuously and how it is currently about one thousandth of a second longer than 24 hours – see image below. Excess length of day beyond 86,400 seconds. How do we add a leap second? There are a number of ways in which the extra second can be added. The famous Big Ben clock keeps time using a pendulum that swings at a rate which can be adjusted by adding or removing old pennies. Adding a penny shifts the centre of mass of the pendulum slightly upwards, shortening the effective length and so decreasing the period and speeding up the clock. A leap second is introduced by removing a penny or two for a while (each one slows the clock by about two fifths of a second over 24 hours). Google will slow their servers from 14:00 today until 10:00 on Jan 1st, during which time each of their seconds will last 13.9 millionths of a second longer than a standard second. This smears the leap second out over 20 hours. Alternatively one could manage it by introducing the leap second all at once. For example, in a digital clock one could imagine the time ticking towards midnight: 23:59:57, 23:59:58, 23:59:59 – but then instead of changing to 00:00:00 at the beginning of the next day, the display changes to 23:59:60 and then 00:00:00, hence adding the second. In a similar way, the famous pips on BBC Radio 4 which mark the top of the hour are adjusted with an extra pip tonight. Who decided the length of a second? Historically, it was very hard to measure time as finely as a second. The first clocks showing seconds did not appear until as late as the 16th century. During the 19th century reasonably accurate watches and other timepieces had become generally available and time standards had also become essential due to the railways and later forms of telecommunication. As accuracy improved, in 1960 the General Conference on Weights and Measures (of the Bureau International des Poids et Mesures – BIPM – who oversee the International System of Units, the SI system) agreed to follow the International Astronomical Union in defining a second as 1⁄31,556,925.9747 of the length of the tropical year of 1900. This used Simon Newcomb’s Tables of the Sun published in 1895 and based on observations made over the period 1750 to 1890, hence centred on about 1820. This number of periods was picked because the value of the second it produces most closely corresponds to the value adopted in the earlier astronomical definition. Because this value dated back to a mean (or average) solar day defined from Newcomb’s Tables, the length of a day as 24 hours or 86,400 of these “standard” SI seconds then effectively corresponded to the average length of a day in the period 1750 to 1890. 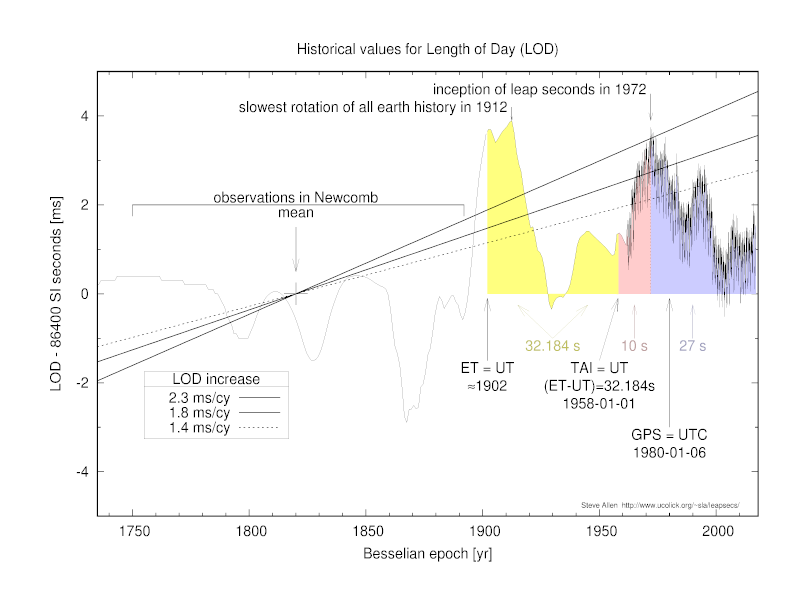 Steve Allen of the Lick Observatory in California has provided an excellent comprehensive resource for finding out more about the leap second. I’d like to share with you a couple of plots from Steve’s website showing how the length of day has changed over time. 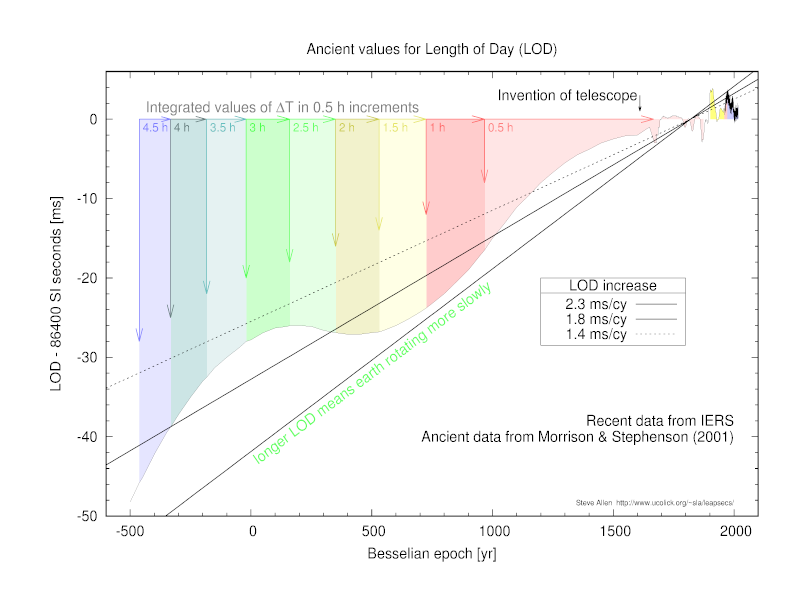 The first, shows the difference between the actual length of day and 86,400 SI seconds (24 hours) over the past two and a half thousand years estimated from records of various astronomical events (eclipses, planetary transits, occultations etc). We can see that around the time of Newcomb’s Tables the difference between the length of day and 86,400 SI seconds (plotted on the vertical axis) is zero but at earlier times it is negative i.e. the day was shorter. About two and half thousand years ago, the day was between 40 and 50 thousandths of a second shorter than the canonical 24 hours. Day length continuously increases due to the tidal deceleration of the Earth’s spin. The three straight lines correspond to different rates of slowing in milliseconds per century. Over this period, the Earth does not appear to have slowed down quite as fast as estimated from tidal models based on laser measurements of the distance to the Moon using the Apollo retroreflectors (the lower line at 2.3 ms per century), possibly due to rebound of the Earth’s crust following the most recent ice age. The next plot zooms in on recent centuries where we have had access to better data revealing that on short timescales the situation is quite complex. First we see that the length of day fluctuates up and down on various timescales. The definition of the SI second that came out of Newcomb’s Tables – zero on the vertical axis – only relates to a mean over the period 1750-1890. We also see that the long-term inexorable slowing of the Earth due to tidal effects (the straight lines sloping from lower left to upper right) are not obvious in the data on such a short timescale. In fact since leap seconds were introduced in 1972, the Earth’s rotation has been speeding up, shortening the length of day. This is thought to be due to fluid motions in the outer core of the Earth, essentially unpredictable and leading to these decadal fluctuations up and down in the spin. Should we keep the leap second? There is an ongoing debate over whether we should abandon the leap second. Some argue that the system for managing them on complex interlinked computer systems could lead to problems. Indeed there were issues for the leap second added on 30th June 2012. On the other hand, are we happy for our clock time to be disconnected from our traditional concept of how time relates to the passing of day and night, and should we be making a decision now when it will be people thousands of years in the future who will see the significant effects. There were a series of public consultations in the UK (whose government has adopted a position of continuing to favour leap seconds) running up to the United Nations International Telecommunications Union World Radiocommunications Conference in November 2015 which was to decide on whether to abandon leap seconds. However, the decision was put off and the earliest it can now be made is 2023. Make the most of your extra second! What a great explanation. Happy new year! Thanks Paul, Happy New Year to you too! Previous Previous post: Why isn’t the earliest sunset on the shortest day?